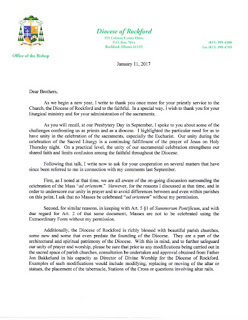 Bishop Malloy of Rockford, which is in Illinois in the USA, has sent a rather remarkable letter to his priests. 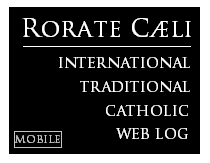 Rorate Caeli received a copy on 16th January, and it is reproduced in full here. As you will recall, at our Presbytery Day in September, I spoke to you about some of the challenges confronting us as priests and as a diocese. I highlighted the particular need for us to have unity in the celebration of the sacraments, especially in the Eucharist. Our unity during the celebration of the Sacred Liturgy is a continuing fulfillment of the prayer of Jesus on Holy Thursday night. On a practical level, the unity of our sacramental celebration strengthens our shared faith and limits confusion among the faithful throughout the Diocese. 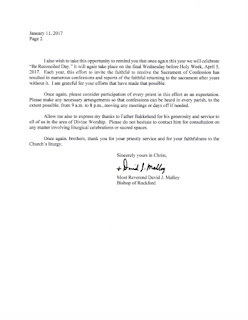 First, as I noted at that time, we are all aware of the on-going discussion surrounding the celebration of the Mass “ad orientem“. However, for the reasons I discussed at that time, and in order to underscore our unity in prayer and to avoid differences between and even within parishes on this point, I ask that no Masses be celebrated “ad orientem” without my permission. Second, for similar reasons, in keeping with Art. 5 §1 of Summorum Pontificum, and with due regard to Art. 2 of that same document, Masses are not to be celebrated using the Extraordinary Form without my permission. The last quoted paragraph is truly astonishing: rather than ignore what Summorum Pontificum says, it refers to sections which state that, to celebrate the Traditional Mass, 'a priest does not need permission, neither from the Apostolic See nor from his Ordinary.' (Art. 2), and that priests should 'willingly' (libenter) accept requests from groups to celebrate the Traditional Mass (Art 5 §1). 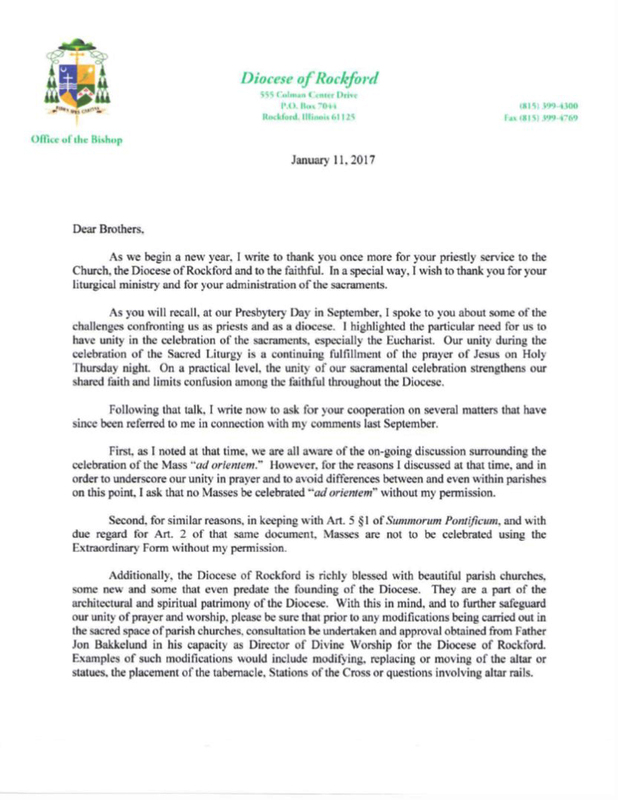 Having referred to these sections, Bishop Malloy then contradicts them: priests do need his permission, and they should not willingly receive requests to celebrate the ancient Mass. Let him [sc. the priest] see to it that the good of these faithful be harmoniously brought into accord with the ordinary pastoral care of the parish, under the governance of the Bishop according to canon 392, by avoiding discord and by fostering the unity of the whole Church. It is also contrary to the whole tenor of the 1970 Missal, which, as has often been pointed out, is a Missal of options. I wonder if any two celebrations of the Novus Ordo in the Diocese of Rockford on a given Sunday use exactly the same texts and ceremonies. There are, after all, multiple options for the Eucharstic Prayer, the acclamations, and sometimes for the readings. Parts or all can be celebrated in Latin, or indeed Spanish, Polish, or any other of scores of languages. The Penitential Rite can be replaced by the Asperges. The Sign of Peace and the Offertory Procession can be included or omitted. The Offertory prayers can be said silently or aloud. The proper chants can be replaced with banal and perhaps heretical 'any suitable' vernacular hymn. 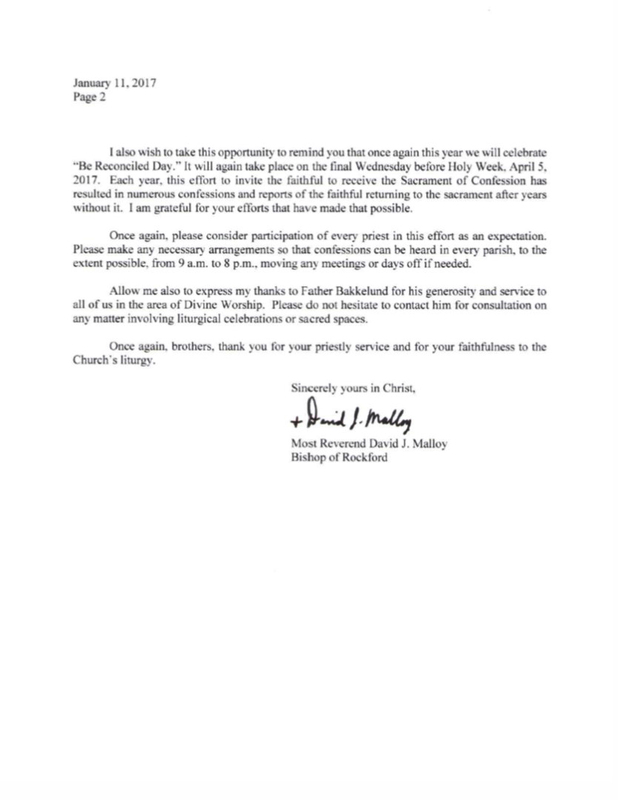 In a number of places the priest is invited to ex temporise. Examples could be multiplied indefinitely. If all the priests of Rockford do all use the same options, if they all stick to the same tried and tested texts and hymns, this is not a sign of unity: it is a sign of laziness, of a failure to explore the richness of the Pauline Missal. At least, that is what liberal liturgical theorists will tell us, and it must be admitted that all those options must have been included for some reason. Did all those trees die in vain? It does not appear that Bishop Malloy is concerned, at present, to stop his priests celebrating the Mass in a variety of languages, using a variety of Eucharistic Prayers and however many other options. Perhaps he is picking his battles and intends to write another letter insisting on the use of EP II and Acclamation IV. The canonical advice I have received indicates that his power to forbid celebration ad orientem is 'arguable', though it should be noted that Catholic churches are not guaranteed to have sanctuaries set up for celebration versus populum. The idea that Bishop Malloy has the right to repeal Summorum Pontificum for his diocese is simply wrong. 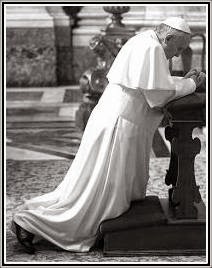 There is no way a bishop can reverse the solemn legislation of the Supreme Pontiff. To cheer up Bishop Malloy's flock, however, he has very kindly uploaded a video of himself taking part in 'car pool kareoke'. Party on! For more on the Church's teaching on liturgical diversity, see the FIUV Position Paper on Liturgical Pluralism. Postscript: A reader in the USA has pointed out to me that Bishop Malloy is not entirely unfriendly to the Traditional Mass. The Institute of Christ the King Sovereign Priest has an apostolate in his diocese, and their website shows him visiting them, and assisting at the Traditional Mass in choro, on 9th August 2015 (scroll down). This does not solve the problems in his letter, of course, but may put them into a little more context.